A big variety of waterfowl puddle ducks, divers, coots and gallinules relish the seeds, tubers, and the plant itself. It establishes very well in the high organic muds of beaver swamps, making it an ideal waterfowl food and brood rearing area for local waterfowl. And it provides food and cover throughout the year. A myriad of insects and crustaceans love the Banana Water Lily (Nyphaea mexicana). Waterfowl, turtles, beavers, muskrats and nutria feast on the water lilies. These animals can make it difficult for banana water lily to establish, so in the early stages, the plants must be properly protected. Once established however, they seem to have no trouble regenerating each year, providing ample food for everyone. Getting the banana water lily established in active beaver ponds requires a strategy that protects the plants from animals. We fence it off with 4 or 5 foot fencing, 2-inch x 4-inch welded wire fence, and 2 x 4 wooden posts Some folks have success with chicken wire or plastic construction fencing. We turn out the bottom 12 inches of fence and put concrete blocks or bricks on top of the wire to keep beavers and turtles from burrowing under. 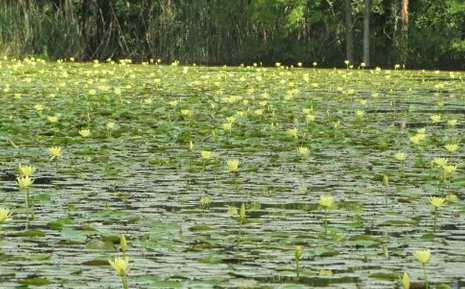 The banana water lilies will bloom with a yellow flower, opening and closing each day for two days. Next, the flower will recede beneath the water to coil around the base of the plant and grow into a seed pod under the water with 30 to 60 tiny, black seeds inside. When this seed pod matures, it bursts open and the seeds, which look like frog eggs, float to the surface for about 24 hours and disperse in and outside the fenced area covering the beaver pond bottom. The plants will continue to produce flowers and seed pods (4 to 8 seed pods depending on plant age), until the fall. In the fall, the Banana Water Lily produces its most prized delight, the yellowish banana-like tubers (hibernacula) that are formed beneath the root system of the plants. The plants reproduce in three distinct ways with seeds, rhizomes (each plant putting off horizontal rhizome roots and starting new plants) and banana-like tubers (hibernacula). The hibernacula (banana tubers) will remain dormant down in the mud and survive for years even when the water dries up, remaining alive in the moist soil to renew the life cycle when the water returns to the wetland. The fenced area will fill with the protected banana water lilies and we sometimes enlarge the fenced area to accommodate the growth. The real purpose of the fence is to allow seed production to continue for a season and float out of the protected area. Once firmly established, the banana water lily holds its own and protection can be removed. In a small beaver pond, wood ducks and other puddle ducks are going to be the primary visitors. Wood ducks will visit year-round, and mallards, blacks, gadwalls, and teal will visit in the winter. Divers may also start to use larger beaver ponds with much open water. We have abundant waterfowl usage on sites as small as an acre and as large as 400 acres. Banana Water Lily is a prolific waterfowl food that will support waterfowl all winter long with moderate shooting pressure, and best of all, it comes back each year. It’s the waterfowler’s gift that keeps on giving.